On Monday November 14, tech-giant Google announced a significant change to its advertising policy: “Moving forward, we will restrict ad serving on pages that misrepresent, misstate or conceal information about the publisher, the publisher’s content or the primary purpose of the web property”. In other words, Google will ensure that fake news websites will no longer have access to Google’s lucrative advertising program ‘AdSense’. The system is in fact the most reliable source of funding for numerous fake-news websites, which rely on traffic rather than content to gain traction on the internet. The announcement comes after Google, one of the world’s largest information sources, was criticized for having influenced the results of the US Presidential elections. Sunday evening, the website Mediaite reported that a link to a fake news story from a website called ‘70News’ managed to crawl its way up to the top search results for “final election vote count 2016”. The fake news source falsely stated that Trump, rather than Clinton, had won the popular vote. After the facts were debunked, many pointed their finger directly to Google for having allowed such a story to make it to the top of readers’ search results. Google’s complex ‘PageRank’ algorithm is designed to search, sort, and rank search results in terms of relevance and quality, but in the case of the US Presidential elections, where high volumes of information were produced and reproduced, even Google’s most sophisticated algorithms couldn’t stop fake news stories from infiltrating the internet. As Google spokeswoman Andrea Faville confirmed “In this case, we clearly didn’t get it right, but we are continually working to improve our algorithms”. In the meantime, Google’s strategy will focus on cutting fake news websites from their funding supply, making it more difficult for these sources to compete with the other countless reliable news sources. Google isn’t the only tech giant to be accused of spreading false facts. Shortly after Google announced changes to its advertising system, Facebook, another internet giant, made a similar update in its ad policy: “We have updated the policy to explicitly clarify that this applies to fake news … Our team will continue to closely vet all prospective publishers and monitor existing ones to ensure compliance.” Facebook will thus also prohibit the display of ads on the platform that spread misleading or illegal content. The statement was made shortly after a similar controversial incident, when a false story claiming that Pope Francis had endorsed Trump was widely circulated on the social media website. But CEO and founder Mark Zuckerberg quickly discredited claims that Facebook had any influence on the US election results, stating “Of all the content on Facebook, more than 99% of what people see is authentic. Only a very small amount is fake news and hoaxes … this makes it extremely unlikely hoaxes changed the outcome of this election”. Yet we have to keep in mind that Facebook reaches an audience of about 1.8 billion people around the world, and nearly half of adult Americans rely on Facebook as a credible news source. Thus, even if 99% of content shared through the platform may be authentic, Facebook’s inestimable reach allows for those few deceptive news stories to instantaneously spread around the globe, and reach a level of traction otherwise impossible to achieve without the global social platform. Now Twitter is getting caught in the mix too. While online harassment and hate speech have always been problematic for the social media mogul, the dramatic rise of cyber abuse during the US Presidential elections compelled Twitter to modify its user policy. Twitter users can now block content they do not wish to see, including “muting words, phrases and even entire conversations”. New features also make it easier for users and ‘bystanders’ to report abusive behaviour, and enhanced training programs will enable Twitter support staff to better distinguish between regular tweets and hate speech. Twitter has also reportedly suspended several American alt-right accounts, after some of these Twitter users were accused of circulating anti-Semitic and overtly racist images on Twitter. Some are furious that Twitter is curbing freedom of speech in a way, going as far as accusing the platform of “corporate Stalinism” and of “purging” their platform’s content. Many, however, support Twitter’s decision to reinforce its corporate policy, which “prohibit[s] violent threats, harassment, hateful conduct, and multiple account abuse” and “take[s] action on accounts violating those policies”. With the Presidential elections settled, many hope that Google, Facebook, and Twitter’s decision to improve their content will cool down cyber tensions, which seem to remain at an all-time high. 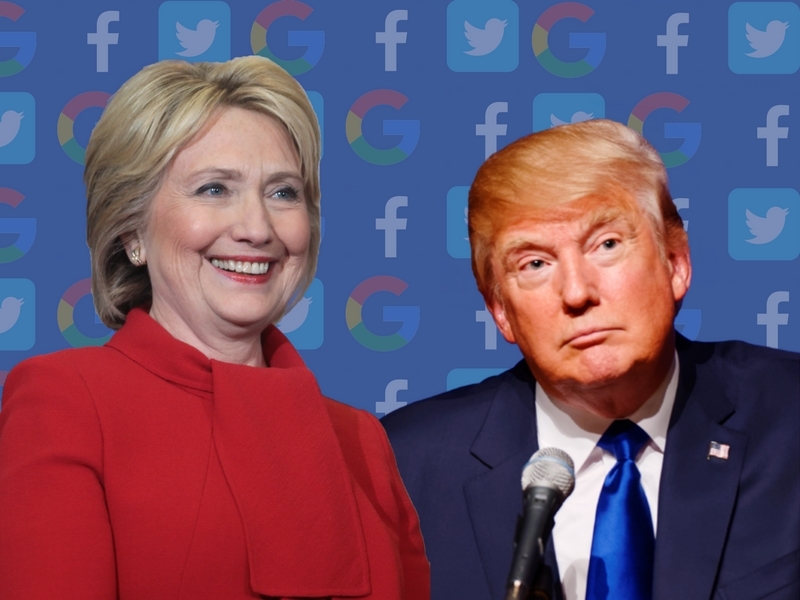 Whether or not you agree with the changes that have been introduced recently by Google, Facebook, and Twitter, the US Presidential elections demonstrated, without any doubt, that the world’s three largest internet platforms have a tremendous influence over the flow of information around the world. In a single day, an average of 3.5 billion searches are done through Google, 1.8 billion users are active on Facebook, and 313 million users are active on Twitter. These three platforms are able to connect people in a way that would simply be impossible in the physical world. Did these three sources influence the outcome of the world’s most followed presidential elections? More investigation will be needed. Yet there is no doubt that in these last months the internet, and social media itself, have proven to be powerful, even dangerous, tools. Photo: “Trump Transparent” (2015), by Michael Vadon via WikiCommons, Licensed under CC 2.0 – “Hillary Transparent” (2016), by Gage Skidmore via WikiCommons, Licensed under CC 2.0. Created by Charlotte Provost via Canva.